Give a drab or dingy wooden fence a fresh face with a lustrous and long-lasting stained finish. Whether your wooden fence is years old or newly installed, it can benefit from a single inexpensive addition: stain. Applying wood stain to the slats improves its design and prolongs the lifespan of your hard-working outdoor structure—a win-win! For long-lasting, professional-quality results, work with a semitransparent oil-based stain designed for the exterior. These stains elegantly accentuate the natural patina of the underlying wood with a subtle tint, and, as a bonus, boast formulas that slow the growth of mildew and rot as well as protect the wood from ultraviolet light exposure. With this straightforward tutorial on how to stain a fence and basic painting supplies, you can refresh your wooden privacy wall in as little time as a weekend—and reap these benefits right away. Before staining a wood fence, scan the weekly weather forecast and select a day with temperatures between 50 and 80 degrees, low to moderate humidity, and no precipitation expected for the next 24 hours. If you’re discouraged by the prospects, remember that “good things come to those who wait”: Extreme cold or moisture can prolong the drying time of wood stain, while the opposite extreme can dry out stain too quickly and leave behind unwanted lap marks on the fence. Depending on the current condition of your fence, you may need to strip or sand the surface. • Starting with a previously stained or finished fence? Apply wood stain or finish stripper to the slats according to the manufacturer’s instructions, then scrub the slats with a stiff-bristle brush to loosen the old varnish and slough off upright wood fibers. • Learning how to stain a fence that is new? Ensure the stain will penetrate the wood with the water test: Lightly spray a small section of the fence with a garden hose. If water beads form on the slats, lightly sand the slats in the direction of the wood grain. Water successfully penetrating the slats, though, indicates that your wooden fence can readily absorb the stain. Clean the fence with water from a high-pressure spray nozzle attached to a garden hose, or, a power washer. This will remove light to moderate dirt accumulations and complete the job of the wood stain stripper in blasting away any old varnish from the fence, if applied. If using a power washer, opt for a low-powered unit operating at no more than 2,000 psi so as not to weather the wood slats. If you spot mold or mildew deposits on the fence, prepare a solution of bleach diluted with water in a bucket. Donning rubber gloves, apply the bleach to the slats with a garden sprayer, allowing it to settle into the slats for a few minutes before rinsing the fence clean with a high-pressure spray nozzle or power washer. Let the fence dry for at least 24 hours before staining. Repair chips or cracks in the fence with wood filler. If needed, replace damaged slats. Use painter’s tape to protect areas of the fence you do not want to stain. Similarly, protect surrounding vegetation at the foot of the fence by covering it with drop cloths. Then, enlist a brush, roller, or sprayer to stain the slats. • A natural-bristle brush is the best way to encourage oil-based wood stain to permeate wooden fence slats. 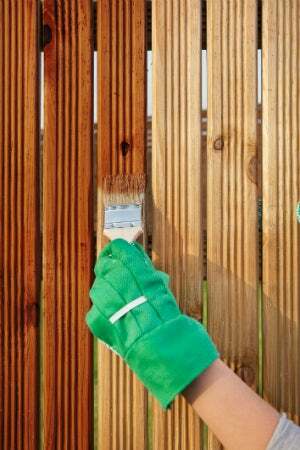 Dip the tip of the brush into a can of stain, then coat any horizontal slats of the fence from left to right. Afterwards, work your way from top to bottom down the entire length of each vertical slat, maintaining a wet tip at all times. Stain one to two slats at a time to prevent lap marks from forming. One you reach the bottom of a slat, stain the end grain. • If using a roller, opt for a medium nap roller cover, then fully saturate the nap with the stain. Apply the stain in two- to three-foot sections of the fence at a time, taking care to back-brush, or re-paint over uncovered areas left by the previous stroke, with a wide brush. This will allow the stain to enter hard-to- reach grooves and recesses, and ensure an even coat free of lap marks. • If using a sprayer, follow the same approach as for how to stain a fence with a roller, but stand back a comfortable distance from the fence to apply color. When the entire fence has been stained, let it dry according to the manufacturer’s instructions. Apply additional coats of stain as needed to achieve the desired depth of color. A single coat should be sufficient for a new wood fence or one that you plan to seal. While a good quality stain alone is sufficient to protect your fence from everyday wear-and-tear, applying a durable sealant over the stain can prolong the finish—and the life of your fence. For best results, apply a single coat of clear, weatherproof sealant by brush, roller, or sprayer. Quickly back-brush unsealed grooves and recesses with a wide brush to achieve a uniform appearance. Allow the sealant to dry completely. Then, dispose of soiled drop cloths, remove the painter’s tape from the slats, and reveal your like-new fence! Go ahead and take the next couple of summers off—you earned it. But while semitransparent stains can last anywhere between two to five years, extreme temperatures and precipitation can prematurely age the finish. 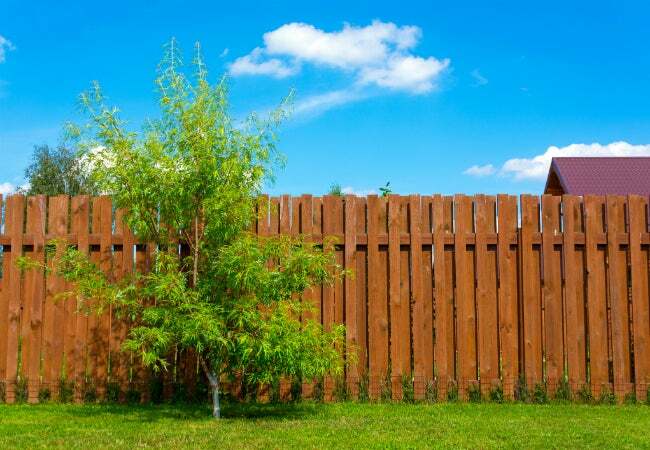 Don’t rest on your laurels too long and risk the weather damage: Aim to stain your fence every two to three years to preserve its sheen and weather protective qualities.